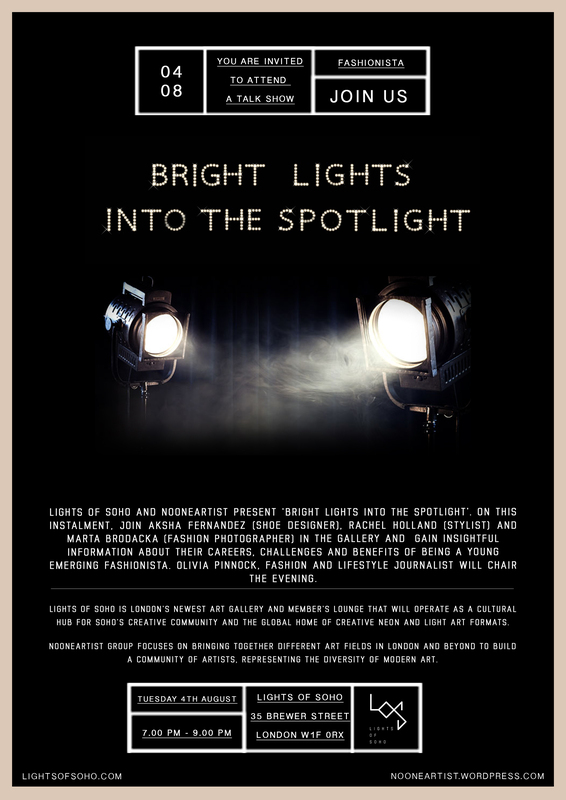 Lights of Soho and Nooneartist present ‘Bright Lights into the Spotlight’. On this instalment, join Aksha Fernandez (shoe designer), Rachel Holland (stylist) and Marta Brodacka (fashion photographer) in the gallery and gain insightful information about their careers, challenges and benefits of being a young emerging fashionista. Olivia Pinnock, fashion and lifestyle journalist will chair the evening. Tags: art, artist, artists, business design centre, creative, design, exhibition, famous, fashion, fashion designer, gallery, lights of soho, london, nooneartist, photography, shoe, stile, stylist, talk. Bookmark the permalink.